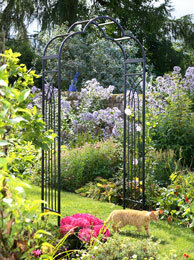 Elegant metal rose arches are a great value full height garden arch. 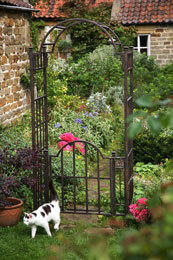 This metal garden arch provides decorative support for climbing plants such as: honeysuckle, clematis and roses. Makes an ideal archway into your garden. 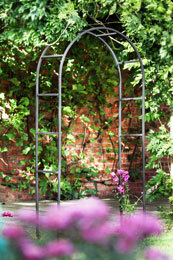 This garden rose arch is made from tubular metal and has a black polyester coated finish for durability. Ideal to be used as a wedding arch for that special day. It is easy to assemble with instructions included. Total height before fitting 2.4m (7't 10 "). Height above ground 2.0m (6' 6"). Below ground 0.4m (1' 4"). Width 1.4m (4' 7") . This garden arch is excellent value for money gothic garden arch. This garden arch trellis provides support for all climbing plants. 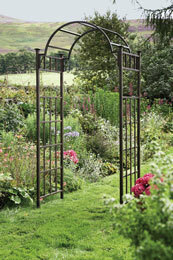 These garden rose arches are made from durable power coated steel. This gothic garden arch is ideal to create a feature for any garden or pathway. 2.9 metres (Height) x 1.4 metres (Wide) x 0.37 metre (Deep). It is recommended to have 0.40 metre below ground for stability. These steel garden arches are made from robust tubular steel. This black arch is finished with in black PVC for weather proof and long life. These archways are ideal for climbing plants. This ornate black metal garden arch feature a gothic styled top with scrolled finial top to give the maximum impact in your garden. Size: 202cm height x 115cm width x 35cm deep. This stunning Gothic Black Metal Garden Arch provides elegant and stylish support for climbing plants such as: Honeysuckle, Clematis and Roses. 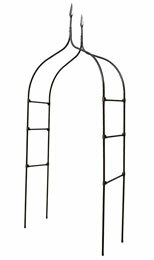 Ideal for framing garden entrances, pathways and views with this garden archway. A top quality product made by Gardman. For the expert gardener when only the best will do. This metal garden arch is made from robust tubular steel. 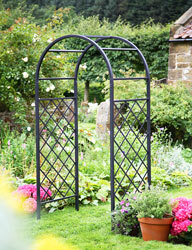 These rose arches have a weatherproof black polyester coated finish for long life. Ideal to be used as a wedding arch for that special day. It is easy to assemble - with instructions included. Only basic tools are required. Excellent value for money. Total height 2.95m (9 feet 8 inches). Height above ground 2.57m (8 feet 5 inches). Below ground 0.38m (1 foot 3 inches). Width 1.4m (4 feet 7 inches). Depth 0.47m (1 foot 6.5 inches). This classic designed metal rose arches are a full height garden arch. Ground spikes are included for easy installation. 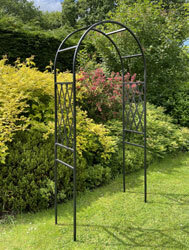 This garden rose arch is made from metal and has a black polyester coated finish for durability. 2.1m (6'10") high x 1.16m (3'9") wide. This Westminster garden arch and seat is the same as the westminster arch above but with the advantage of a seat. This arch and seat is a classic design with tough of gold detailing on the seat and the arch. Made from heavy-duty square section steel coated with black PVC coating for long-life. Seat and arch come complete with ground spikes. Size: 2.1 metres high x 1.16 metres wide. RRP £139.95 - Our Price Only £89.99. This Westminster garden arch and gates is the same as the westminster arch above but with the advantage of a seat. This arch and gates is a classic design with tough of gold detailing on the seat and the arch. Made from heavy-duty square section steel coated with black PVC coating for long-life. Westminster gated arch with gates come complete with ground spikes. This garden rose arch is made from metal and has a Verdigris polyester coated finish for durability. RRP £139.95 Our Price £89.99. These garden arches with gates has a lovely wave shaped top. This arch and gate is made from strong square shaped 4cm steel sections with a black coated finish. The Knavesmire arch and gate is very strong and rigid arch with one piece full height side sections. This arch with gate comes with two opening ornate design gates. Gates bolt together to hold shut. Size: 213cm high x 122cm wide x 40cm deep. These garden archway strong constructuion with elegant styling. This archway has detailed side panels to offer support for the long stemmed climbing plants. This garden arch is traditional style arch. Size: 2.4 metres High x 1.2 metres High. 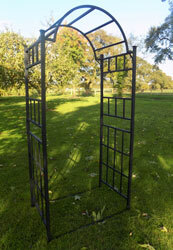 These garden archway strong constructuion with Sturdy one piece side panels.. This archway has shaped top section with spiral finals , ideal long stemmed climbing plants. This garden arch is traditional style arch. This black final garden arch features within the design six spiral finial , two on the very top of the arch and two on either sides of the arch making this arch have the maximum impact in your garden. This archway is made from square section steel with a black PVC coating offering weather protection. Size: 206cm height x 108cm width x 35cm depth. This classically styled garden archway is a heavy duty garden arch. This arch way is manufactured from square section steel with PVC black coated finish. The side sections of this garden arch are one section which makes this arch stronger and sturdy than other arches with more joints. This black metal arch way comes complete with four ground spikes which allow the secure fitting into soft ground such as lawn. The metal lattice steel work makes it ideal for the growth and climbing of plants. This garden arch and gates is made from square section steel with lattice side sections making a strong and durable garden archway. The steel section is coated with PVC black coating which offers protection against our weather conditions. The side sections of this garden arch are one section which makes this arch stronger and sturdy than other arches with more joints. This black metal arch way &gates comes complete with four ground spikes which allow the secure fitting into soft ground such as lawn. The metal lattice steel work makes it ideal for the growth and climbing of plants. Size: 214cm height x 114cm width x 52cm depth. 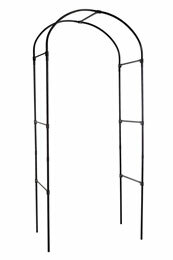 These garden archway strong constructuion with Sturdy one piece side panels. This garden arch is traditional style arch. 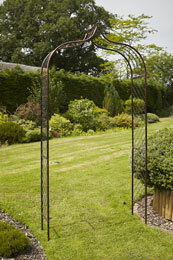 This metal garden arch has unusual design with shaped top section and detailed side panel. These garden arches create a stunning garden feature. This garden arch is manufactured from square section steel. All these metal garden arches are made with minimal number of joins to aid rigidity and strength. This metal garden arch is supplied with ground fixing bars for fixing to hard surfaces and ground spikes for securing into soft ground. Garden Arch Size: Wide: 107cm (42") x Depth: 40cm (16") x Height 225cm (88"). 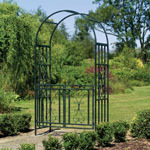 This garden rose arch has an art deco style design with square section steel. This iron garden arch has an Antique bronze finish. This wide garden arch creates a stunning garden feature. This arch for garden is manufactured from square section steel. All these metal garden arches are made with minimal number of joins to aid rigidity and strength. This steel garden arch is supplied with ground fixing bars for fixing to hard surfaces and ground spikes for securing into soft ground. Garden Arch Size: Wide: 114cm (45") x Depth: 45cm (18") x Height 208cm (82"). These steel garden arches are manufactured from robust square section steel. This arch for garden are made with a minimal nymber of joints to aid rigidity ans ease of assemby. This garden arch way has an elegant design with finial detail. These steel garden arches create a stunning garden feature. This arch for garden is manufactured from square section steel. All these arches for garden are made with minimal number of joins to aid rigidity and strength. This steel garden arch is supplied with ground fixing bars for fixing to hard surfaces and ground spikes for securing into soft ground. Garden Arch Size: Wide: 122cm (48") x Depth: 52cm (20") x Height 233cm (92"). This garden arch way has an classic styling with rigid side supports with cross members. These steel garden arches create a stunning garden feature. This arch for garden is manufactured from square section steel. All these arches for garden are made with minimal number of joins to aid rigidity and strength. Garden Arch Size: Wide: 110cm (43") x Depth: 40cm (16") x Height 240cm (94"). 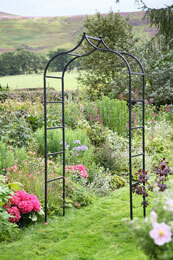 This extra heavy duty garden rose arch has a curved top section with column detail. These garden arches and gate has a sturdy hinged gate with slide bolt. This garden arch with gate has an black finish. This wide garden arch creates a stunning garden feature. This metal garden arch with gate is manufactured from square section steel. All these metal garden arches are made with minimal number of joins to aid rigidity and strength. This steel garden arch is supplied with ground fixing bars for fixing to hard surfaces and ground spikes for securing into soft ground. Garden Arch Size: Wide: 104cm (41") x Depth: 68cm (27") x Height 229cm (90"). This garden rose arch has a curved top section with column detail. These garden arches and gate has a sturdy hinged gate bolt. This wide garden arch creates a stunning garden feature. This metal garden arch with gate is manufactured from square section steel. All these metal garden arches are made with minimal number of joins to aid rigidity and strength. 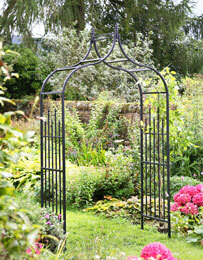 This steel garden arch is supplied fixing bars for fixing to hard surfaces for securing into soft ground. Garden Arch Size: Wide: 104cm (41") x Height 200cm. 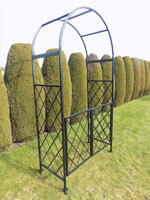 This extra heavy duty garden rose arch has a curved top section with column detail. These wide garden arches have an black finish. This wide garden arch creates a stunning garden feature. This metal garden arch with gate is manufactured from square section steel. All these metal garden arches are made with minimal number of joins to aid rigidity and strength. This steel garden arch is supplied with ground fixing bars for fixing to hard surfaces and ground spikes for securing into soft ground. 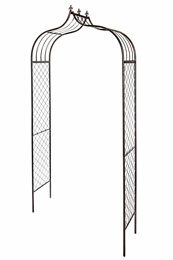 This heavy duty lattice garden rose arch has lattice style side panels design with square section steel. This iron garden arch has a traditional design. This wide garden arch creates a stunning garden feature. This arch for garden is manufactured from square section steel. All iron garden arches are made with minimal number of joins to aid rigidity and strength. 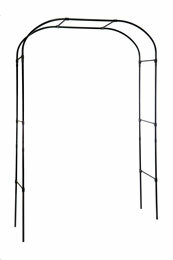 This extra wide garden arch is supplied with ground fixing bars for fixing to hard surfaces and ground spikes for securing into soft ground. This decorative white garden arch is ideal for weddings with the scrolled detailing on front and side panels. This metal garden archway is made from tubular metal section, making a strong and sturdy garden feature. Metal is PVC coated white to with stand weather conditions. Size: 202cm height x 115cm width x 35cm depth. 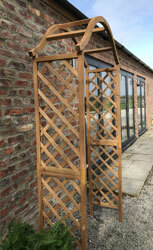 This garden arch is from the Loire Range 'signature range '. These iron garden arch is decorative iron arch with a scroll design. This arch for garden is a white-grey wash finish with detailed side panels. 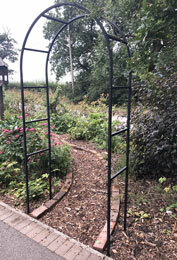 This rose arch can be sunk into ground or used with metal ground spikes. Size of arch steel: 2.4m High x 1.2m Wide. This metal garden arch is from the Nature Range. 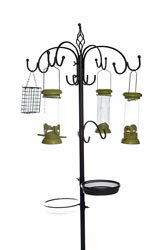 This arch for garden is a bronze finish with bird and leaf design, detailed side panels. This garden arch metal can be sunk into ground or used with metal ground spikes. This heavy duty lattice garden arch with seat has lattice style side panels design with square section steel. This garden arch and seat has a traditional design. This wide garden arch creates a stunning garden feature. This arch for garden is manufactured from square section steel. All iron garden arches are made with minimal number of joins to aid rigidity and strength. This garden arch with bench is supplied with ground fixing bars for fixing to hard surfaces and ground spikes for securing into soft ground. This heavy duty lattice garden arch with seat has lattice style side panels design with square section steel. This garden arch and seat has a traditional design. This arch for garden is manufactured from square section steel. All iron garden arches are made with minimal number of joins to aid rigidity and strength. An economical way of making a pergola by using three metal arches. Manufactured from tubular steel with black PVC coating finish for long-life. These 3 arches are full height and will provide support for climbing plants. Quick and easy to assemble. Each arch before fitting 240cm and 200cm high when fitted into the ground, allowing 40cm below ground for stability, 140cm wide and 37cm. The total length of the pergola archway is 282cm, allowing 20cm between each arch. These garden arches are handmade in Yorkshire and easy to assemble with only four section to bolt together making this garden archway a very rigid rose arch. Made from round bar with black plastic coating. Nice designed garden arch ideal for any size of garden. Size: 233cm high x 110cm wide x 33cm deep. These metal garden arch ways are handmade in Yorkshire and easy to assemble with only four section to bolt together making this garden arch way a very rigid climbing rose arch. Made from round bar with black plastic coating. Nice designed arch ideal for any size of garden. Size: 240cm high x 110cm wide x 33cm deep. These hgarden arches are very ornate with an intricate rose design. This archway featues delicate hand crafted rose detailing. These arch-ways are made iron with a painted cream finish look also giving weather protection. This arch will enhance your garden. Size: 230cm (90") high x 120cm (47") wide x 37cm (14") deep. These garden seat and arches are very ornate with an intricate rose design. This archway with bench featues delicate hand crafted rose detailing. These arch-ways and seats are made iron with a painted cream finish look also giving weather protection. This arch with seat will enhance your garden. This seat will hold weight up to 250kg. Size of seat: 53cm high x 101cm wide x 47cm deep. This green metal garden arch is new for this season, made from steel with green PVC coating which offers protection against weather and dis colouring. This green garden arch feature on both side section an ornate leaf design, so when the climbing plants are getting established it make a lovely garden feature in your garden. Size: 208cm height x 123cm width x 51cm depth. Ornate Green Garden arch with Gates. This green ornate garden arch and gates is again new for this season with lovely ornate scrolled framework and gates it will grace any entrance to a garden and path way. This green ornate archway is manufactured from steel with a green PVC coating which will offer weather protection all year round. Size: 204cm height x 128cm width x 37cm depth. This garden arch is from the Woodlands collection and has a leaf design with elegant scroll top. This garden archway is very sturdy made from tubuar steel with a black plastic coating for all year around protection. Steel fixing bars to allow to be fitted onto hard surfaces. Size: 240cm high x 120cm wide x 45cm deep. Click here for larger image of arch. Metal ground spikes made from metal with a PVC green coating to prevent rusting. Ideal for use on metal arches to secure into soft ground. This garden arch with gates is made from tubular steel sections, making this arched garden gate a sturdy gated arch. These gated archways have decorative metal detail on sides and front for good looks and support for climbing plants. This gothic style garden arch and gates will make an ideal entrance to your garden. Size: 240cm high x 120cm wide x 40cm deep. These spiral garden arch with gates makes creates a stunning entrance to your garden. This metal garden arch with gate is manufactured from square section steel. All these metal garden arches are made with minimal number of joins to aid rigidity and strength. Garden Arch Size: Wide: 106cm x Height 215cm. This garden arch with high gates is made from tubular steel sections, making this arched garden gate a sturdy gated arch. These high gated archways have decorative metal detail on sides and front for good looks and support for climbing plants. This garden arch and high gates will make an ideal entrance to your garden. Give your garden inspiration with our traditonal metal palnters. All these are manufactured from steel making durable and strong planters. Please click image to view.